For his Nasu Dengaku, Best New Chef Kevin Tien of Himitsu in Washington, D.C., brushes eggplant with a sweet yuzu-miso glaze, broils it until smoky and tender, finishes it with a lime-chile-soy vinaigrette with Szechuan peppercorns, and tops it with roasted pumpkin and sesame seeds. Stir together sugar, mirin, and sake in a small saucepan. Bring to a simmer over medium; cook 1 minute. Remove from heat; add miso and yuzu juice; stir until smooth. Set aside. Cook canola oil, Sichuan peppercorns, crushed red pepper, garlic, cinnamon, star anise, and ginger in a medium saucepan over low, without stirring, 30 minutes. Remove from heat, and cool completely, about 30 minutes. Pour oil mixture through a fine wire-mesh strainer into a bowl; discard solids. Add lime juice, soy sauce, black vinegar, sesame oil, and sugar to oil, and stir to combine. Preheat oven to 375°F. Place eggplant halves, cut side up, on 2 large rimmed baking sheets. 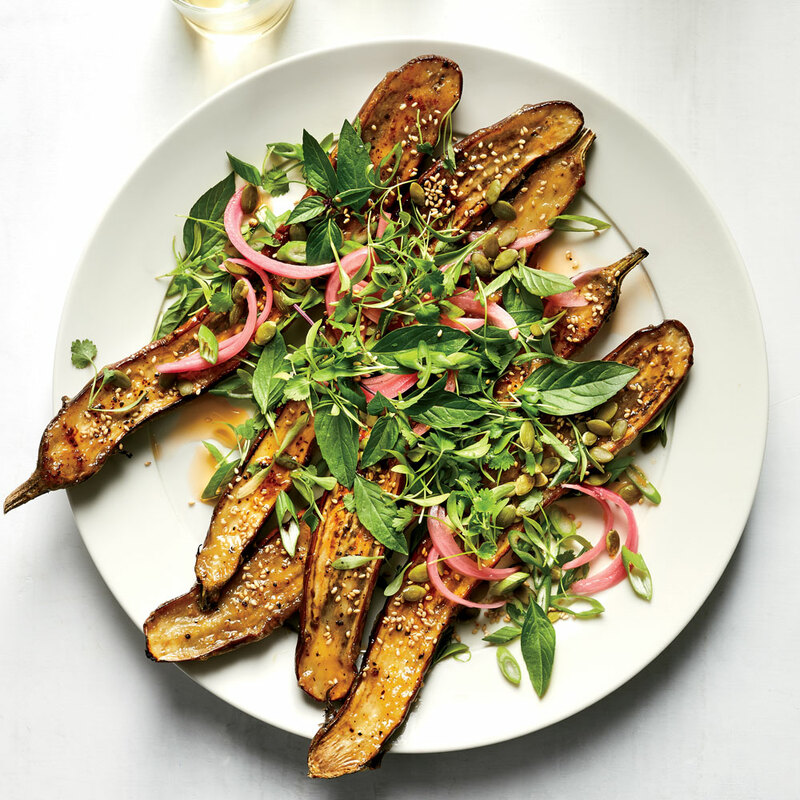 Brush cut sides of eggplant with canola oil; sprinkle with salt and black pepper. Bake in preheated oven until tender (a toothpick slides in and out easily), about 10 minutes. Increase oven temperature to broil. Brush cut sides of eggplants with yuzu-miso glaze, and broil until slightly charred and glaze begins to caramelize, about 7 minutes. Transfer to a serving plate, and drizzle with lime-chile-soy vinaigrette. Sprinkle with pumpkin seeds, scallions, and toasted sesame seeds.